It was the most important regular season game Florida and FSU have ever played, and easily the most important midweek game in school history. Not because the winner would right its season’s metaphorical ship, or because it would cement the baseball epitaph of legendary FSU coach Mike Martin in the winning school’s favor, but because of both of those things- and more. For all that’s gone wrong for the Gators so far in 2019, they managed to win it- and stamped their archrivals with several ignominious distinction that will live on for the rest of time. It took less than a month of this season to realize that coaching his program to a fifth straight CWS berth could be the most difficult task of Sully’s career: a pair of starting pitchers (Brady Singer and Jackson Kowar) from the 2018 team went in the first round of the 2018 MLB Draft, the team’s most talented player (Jonathan India) went #5 overall in that same draft and the program’s first ever captain and arguably the most lovable Gator baseball player of all time (JJ Schwarz) finally graduated to leave four crater sized holes to have to replace at once. That alone could be overwhelming, but then on top of that were the miscellaneous personnel losses that in almost any other year would be considered seismic but took a backseat to those first four, with Derek Jeter-esque shortshop Deacon Liput, all time saves leader Michael Byrne and the ultimate Sully Swiss army knife Nick Horvath all departing for the MLB as well. For all his amazing achievements and recruiting success, not even Sully can just replace the totality of those losses without some turbulence, and that turbulence has resulted in a less than enjoyable 2019 campaign to this point. Florida has been just about knocked out of the SEC race with just 40% of the conference slate complete, and at times has looked even worse than that statement would suggest, like when the Gators got swept by Vanderbilt three weekends ago by a composite score of 34-6, or when they blew an 8-0 lead in the finale against Mississippi to ensure that they would get swept in that series too. The sum of all that, coming into yesterday, was a 21-13 record and the first game that Sully coached an unranked Gator team since March of 2014. However, while the Gators’ numbers have regressed, the choke hold on the SEC has been vanquished and the streak of four consecutive trips to the College World Series appears to be in serious jeopardy, one thing has remained constant: Sully’s program owns FSU. And last night, his Gator club dealt the Seminoles the most eternally devastating loss in a twelve year career that’s been stockpiled with them. Part of what made the loss so devastating for FSU- and so exhilarating for Florida- was the way it played out. Florida’s bats suffered a mostly silent night, being kept hitless until Brady McConnell broke it up with a single up the middle. He was left stranded, though, as was Austin Langworthy an inning later after his nearly identically placed single. So too, for that matter, were Cory Acton and Jud Fabian after starting off the eighth with a single (on just the second ball off a Gator bat to reach the outfield of the night) and a walk, respectively. So for the first eight innings, Florida’s offense failed to generate a single run. Thankfully, it didn’t need to, because FSU continued its recent tradition of self-destructing against Florida by granting McConnell one of the most wholly unearned trips around the bases in series history in the fourth inning. Center fielder JC Flowers got too casual with his approach to a routine fly ball, dropped it, and then bobbled it trying to pick it up, by which time McConnell had motored into second base. For an encore, after McConnell had been sacrifice-bunted over to third, one of the 88 pitches that FSU starter Conor Grady used to flummox Gator hitters also fooled catcher Matheu Nelson, who appeared to be crossed up by a ball that missed the zone by maybe an inch and let it bounce off his glove to the backstop. That scored McConnell and gave Florida a 1-0 lead. FSU would counter with a run of its own in the fifth. Florida starter David Luethje ended an overall stellar outing on a down note by walking leadoff hitter Nander De Sedas. Justin Alintoff came in for Luethje and allowed a single to Nelson before settling in, but a double steal following a strikeout and an RBI groundout from Alec Sanchez knotted the game at one. And the game stayed knotted at one, with neither team threatening again, until the ninth. With one out, Kendrick Calilao became the first Gator of the night to really barrel up a pitch and blasted it into the left center field gap for a double. Langworthy struck out, but then Mike Martin opted to intentionally walk Wil Dalton to apply the forceout possibility and set up a lefty-lefty matchup between his pitcher Clayton Kwiatkowski and Cory Acton. O’Sullivan responded by sending up his pinch-hitting pitcher dual threat, Kirby McMullen. Who promptly immortalized himself in Gator baseball lore by delivering the shot heard ’round the Sunshine State. McMullen was stranded at third, but it didn’t matter. Now with a 3-1 lead, freshman Ben Specht came out for his third inning of work and quickly mowed down the Seminoles 1-2-3 to clinch the historic victory. On the surface, it doesn’t look like much. It was just a midweek game, after all, and the culture of college baseball dictates that those generally don’t mean a damned thing (which is why I absolutely despise the fact that this is a midweek series). 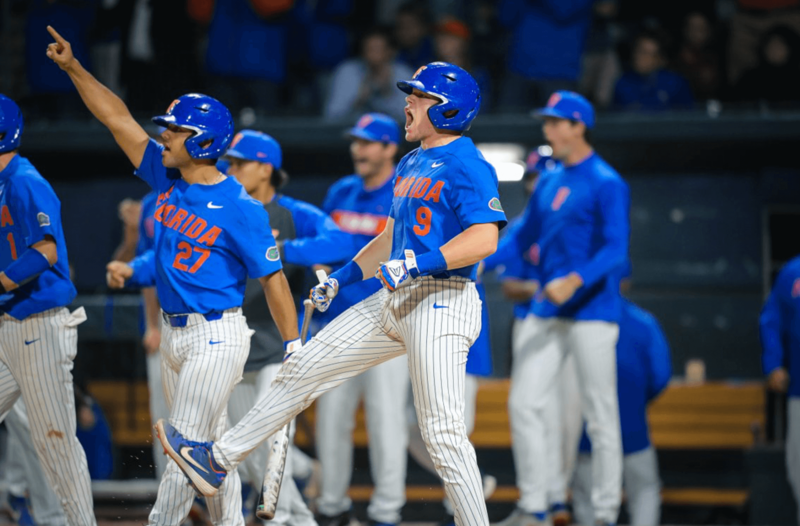 The Gators received the #1 overall seed in last year’s NCAA Tournament despite suffering a two game midweek sweep at the hands of Central Florida and losing additional midweek home games to Jacksonville and Mercer. Naturally, because of the history between the two schools, this particular midweek matchup matters more than others, but even still, a stray midweek win simply doesn’t carry much weight. Except in last night’s case, which carries all the weight in the world and will continue to until the end of time for an array of reasons. Most of has to do with the status of the soon-to-be-retired Mike Martin, who many believe is college baseball’s greatest coach ever. Though he does not possess a national championship ring, he’s unlocked pretty much every other achievement: he owns the most wins of any college baseball coach ever with 2006, 39 trips to the NCAA Tournament (one for each year he’s coached there) and sixteen different College World Series appearances. And now he also owns a losing record against archrival Florida (76-77), courtesy of eleven straight losses to the Gators to match his uniform number. Unless you care to argue that this stumbling Seminole team will somehow reach the postseason, meet Florida in the postseason and then beat Florida in the postseason, the so-called GOAT will carry that losing record to his biggest rival to his grave. Just take a second to absorb the gravity of all that. It doesn’t help a school’s athletic prestige when its unquestioned greatest ever football and baseball coaches to each retire with losing records to their rivals, but pair Bobby Bowden’s 17-18 record against Florida with Martin’s 76-77 mark, and that’s exactly where FSU sits. Speaking of those eleven straight FSU losses to Florida: that’s unheard of in a baseball series between two power conference schools, but it actually fails to do the recent success the Gators have had against the Noles justice. Not only did Florida just expand upon the longest winning streak in series history for either team, they also finished off a three game sweep of the Seminoles, which is becoming something of a tradition in Gainesville. Florida now has a four year regular season sweep streak going over the Seminoles- meaning that they took all three regular season meetings with FSU in 2016, 2017, 2018 and now 2019- and Martin will carry that badge of honor with him into retirement as well. Then factor in additional such hat tricks in 2012 and 2014. That means that in six of the last eight seasons, Florida has swept FSU in the regular season series. For an added bonus, the Gators also handed the Noles a bloody two game NCAA Tournament Super Regional sweep by a composite score of 24-9 in 2015, and bounced back from an opening game loss on the same stage the following year to deliver two more beatings by a combined 12-0 margin. Add all that up, and you have 15 Florida victories in the last 16 matchups with the Noles, and 20 in the last 23 games as nice little footnotes to that 11 game losing streak Martin exits the stage with. That run of sheer dominance has drawn the Gators within seven games of the Seminoles in the all time head to head baseball series (121-128), which is actually more meaningful in terms of bragging rights than it appears to be on its own. Of the twelve sports that Florida and FSU both play at the varsity level, baseball is the only one that FSU leads the head to head series in, and women’s soccer is the only other one that’s closer than eight games (13-12). That means if O’Sullivan can keep beating FSU at this clip and the Gators’ women’s soccer team can hang on, Florida is suddenly just three years away from owning head to head series leads over FSU in every single sport. Of course, this Gator baseball team would prefer to not be finished writing its own legacy yet. There’s a stable of young but extremely promising arms (Luethje, Alintoff, Specht, Nolan Crisp, Tommy Mace, Christian Scott and Jack Leftwich) who have at least one more full season after this one to continue their development, and some of the freshman hitters he’s brought in (Calilao, Fabian, Young and Acton) have hit the ground running. As Florida has demonstrated too many times as the victim of this, college baseball rarely crowns its best team as the champion, but more often the hottest team in May and June. If the Gators’ starting pitching staff can follow the example the freshman trio set last night, and the bats continue to heat up, it would be foolish to completely discount Sully’s club from doing some real damage in the NCAA Tournament this year. If not, and if Florida’s season ends in the disappointing fashion that the first 35 games have hinted that it’s likely to end in? Then at the very least, this team has a special place locked up in school history thanks to all the mark they made against its biggest rival.